The newly-reinstated National Secretary of the People Democratic Party (PDP), Prince Olagunsoye Oyinlola, on Monday was suspended by the ruling party for anti-party activities. 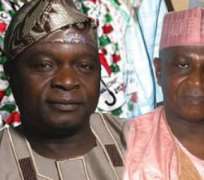 The former Osun State Governor was suspended along with three other key members of the New PDP faction, Alhaji Abubakar Baraje; the Deputy National Chairman, Dr. Sam Jaja; and the Deputy National Vice-Chairman (North-West), Amb. Ibrahim Kazaure. Their suspension came barely six days after the Court of Appeal restored Oyinlola as the PDP national scribe. The announcement came on the day the New PDP vowed to ensure that the Bamanga Tukur-led National Working Committee of the PDP was served the court order to pave the way for the ex-governor's return as the national secretary of the party. The National Publicity Secretary of the PDP, Chief Olisa Metuh, at a news conference in Abuja, said the suspension of the four politicians was to serve as a deterrent to others. He explained that the decision was taken at a meeting of the National Working Committee of the party on Monday. Metuh said that Baraje, Oyinlola, Jaja and Kazaure had breached some sections of the PDP constitution. Sources at the Wadata Plaza national headquarters of the party, said the walkout staged by some members of the party, including the suspended politicians and some governors at the PDP mini- national convention in Abuja on August 31, would be used against Oyinlola and others. Metuh said the four men were expected to appear before the PDP Disciplinary Committee soon. He accused Oyinlola, Baraje and the two others of stealing identity of the party, which he said had been settled by a law court. Metuh said, 'There is only one PDP, there can never be two PDP. The court has pronounced on this and I tell you that there is only one PDP. 'But we have witnessed an attempt at political identity theft where some aggrieved people are colluding with some unknown people to steal our identity. That has failed. 'We have appealed to our brothers that this is not a Nollywood production or drama. This is a party in power and we have to work with the President to deliver the dividends of democracy. 'The NWC after its meeting today(Monday) has announced, in line with the constitution of our party, and after a preliminary investigation suspended Baraje, Oyinlola, Jaja and Kazaure. Metuh said the party had been slow in taking decisive actions against them for a long time because it thought that they would change their ways. He said when this was not forthcoming, the PDP had no option but to suspend the four men. This action, according to him, is to serve as a deterrent to other members of the PDP and also to show the committed members that they must remain loyal. Asked why the seven governors, who are members of the New PDP were not also suspended, Metuh said they were not holding positions in the splinter group. The governors are Abdulfatah Ahmed(Kwara); Aliyu Wamakko(Sokoto); Rotimi Amaechi (Rivers), Babangida Aliyu (Niger); Murtala Nyako(Adamawa); Musa Kwakwanso (Kano) and Sule Lamido (Jigawa). On why the party took the decision a few days after the Court of Appeal ordered the reinstatement of Oyinlola, Metuh said its leadership had been busy. He said that while Tukur had been busy with international engagements, the party was involved in legal matters regarding the November 16 governorship election in Anambra State. The spokesperson for the ruling party also said that the party had yet to be served the Court of Appeal judgment. But Oyinlola said their suspension was part of the impunity they had been complaining about in the PDP. He wondered why only four people were singled out for punishment, even when the party was yet to query them. The former governor claimed that the party took the decision with a view at circumventing the appellate court judgment. He said, 'This is part of the impunity we are protesting against. None of us has been queried or requested to give explanations for any alleged offence. 'And if they are reacting to the issue of the New PDP, why did they decide to leave out the serving state governors, senators and members of the House of Representatives who have been very vocal? Also, the National Publicity Secretary of the New PDP, Chief Chukwuemeka Eze, said the PDP under Tukur lacked what he called democratic character. He said that Tukur and his men did not understand the PDP constitution. Eze said, 'The problem we are having with Tukur and his NWC is that they lack not only democratic character but also common understanding of the PDP Constitution. He said with these sections of the party's constitution and considering that Oyinlola by his position as the national secretary of the party, the suspension was null and void.